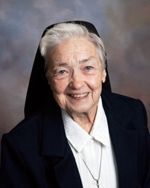 Immaculate Heart of Mary Sister M. Ann McGovern, 83, died Nov. 19. She was in the 65th year of her religious life. Born in Philadelphia, Sister Ann entered the Congregation of the Sisters, Servants of the Immaculate Heart of Mary in 1950 from Most Blessed Sacrament Church and professed her vows in 1953. She taught in various elementary and secondary schools in the Archdiocese of Philadelphia and the Dioceses of Trenton, Metuchen and Allentown. For nearly 20 years Sister Ann served as a pastoral minister in various hospitals including her last assignment at Methodist Hospital in Philadelphia. Her funeral Mass was celebrated Nov. 25 at Camilla Hall in Immaculata, and Father William E. Dean was celebrant and homilist. Concelebrants were Fathers Francis J. Sabatini and Charles J. Noone, and Msgr. Joseph Logrip. Sister Ann is survived by members of her local community from Mary Immaculate Convent in Philadelphia, her Congregation of IHM Sisters, her brothers Thomas, Francis and many loving nieces, nephews, grandnieces and grandnephews. She was predeceased by her parents, Thomas and Mary J. Noone McGovern, her sister Mary Hamill, and her sister-in-law Nancy (Francis) McGovern.